There is one thing I am craving during this heat wave. And I mean, besides a margarita. All I want are crisp, fresh things. Like fruit and shrimp and stuff like that. Sort of salads, but not really. Since you know how I like my salads. More like melon and milkshakes and things that are water-packed and ultimately cool me down. If I’m being honest, I really just want popsicles but keep forgetting to buy them and have been too lazy to make my own. Plus… it would probably be physically impossible of me to not accidentally on purpose drop some booze into the popsicle mold. The thing is though that when it comes to beverages, one healthy habit I was born with was to freaking love water. Like, LOVE it. Most days it is all I crave and all I drink. I love it plain, even from the tap. It rarely bores me. I don’t like bubbles. I even remember leaving dance classes when I was younger (we’re talking like 8 years old) and just wanting a giant glass of water and nothing else. I believe that it’s the universe’s way of making up for my asinine adoration of things like bacon and cheese. Oh, bacon cheeseburger with ice water to drink? Automatically healthy. Jessica justification. So that’s why a marg isn’t the number one thing on my mind. I like to drink those in addition to my water but since I perspire like a man, I’m better off chugging a gallon of water THEN getting my salty rimmed tequila drink on ice. Needless to say, these quesadillas certainly don’t mind a margarita as an accompaniment. The shrimp is marinated in beer so an ice-cold Corona will do the trick too. The quesadillas are also stuffed with mango and tomatoes and are just… refreshing. Well you know, as refreshing as a quesadilla can be. If you have one of those electric griddles or skillets then you don’t even need to turn on the oven. I freaking love mine. We use it constantly. Oh and I paired it with some quick guacamole that’s mixed with a little heat. So good. And then I sat in the air conditioning for the rest of the night so I didn’t melt into a giant puddle. Am I one of those people who wants it to be summer all year round and then the minute that it is summer I complain about it being summer? Yep. I am. Place the shrimp in a large baking dish or ziplock bag. Cover it with the 8 ounces of beer, lime juice and zest, adobo sauce and peppers, salt and pepper. Refrigerate and marinate for 30 minutes. After 30 minutes, heat a skillet over medium high heat and add the shrimp with the remaining 2 tablespoons of beer. Cook until the shrimp is pink and opaque, abut 3 to 5 minutes. To make the quesadillas, heat a large nonstick skillet or electric griddle over medium-low heat. Add a bit of cheese on the bottom of each tortilla, then divide the shrimp evenly between the two. Cover with the mango, tomatoes, onions and remaining cheese, then top with the other tortillas. Cook until the cheese is melted and the sides of the tortillas are crispy. Serve with the guacamole, sour cream or greek yogurt and extra mango. Combine all ingredients together and mash until combined. This looks like alot of work and when I’m hot I definitely don’t wan to be cooking but I think that this might just be worth all of the sacrifices! Everything’s better with a side of guac! This was delicious! We loved it! I couldn’t wait to have it for lunch the next day and I did not share or offer it to anyone else. I thought about it all morning! The combination of shrimp, mango and the spicy guac — oh loved it!! Thanks for sharing! It’s not quite as hot here (Seattle) as it is in the rest of the country but when the sun starts shining all I want is Mexican food…and Coronas. Lots of coronas. This looks like the perfect thing to go with them! goodness gracious — these look amaaaazing. and the line about sweating like a man made me LOL. good post! I would like to place an order for this quesadilla for lunch please and thank you! Summer food is the effing BEST. Especially when it’s Mexican food. I die. If I had to choose one type of food to have to eat for the rest of my days, it would be Mexican, hands down. What other type of cuisine is it necessary (yes, NECESSARY) to cover everything in cheese? I rest my case. You probably need to post and re-post this until everyone makes it. We made it with whole wheat tortillas and chicken [instead of shrimp] last night. IT WAS SO AMAZING. My husband was RAVING over the spicy guac. Usually he prefers to make sauces, etc. because he adds other flavors to it – but I made the spicy guac and he was like “What’s in that. It is so good. We need to make this again. I seriously love this.” Wife of the night award, thanks to you, again. Made this last night. WOW. Amazing. I added some roasted sweet corn too, which was fabulous. However, I had a couple questions on the recipe: (1) where does the garlic go? In the marinade or when you’re cooking the shrimp? (2) do you cook the shrimp in the marinade or discard before cooking? Thanks so much for posting! We’ll definitely be having these again soon! 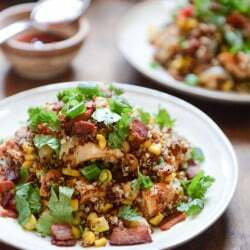 I am a mexican and I have to say this recipe is very original and looks so delicious! My husband found your blog and would send me emails with your recipes and the pictures of course. This was the first recipe I made for him from your blog and it was awesome! So much flavor! I will double the recipe next time! I have only made a few of your great recipes and hope to make more in the coming year. Every one has been delicious! This recipe looks amazing but I don’t eat shrimp! Do you think I could substitute with chicken instead and still get the same outcome?! 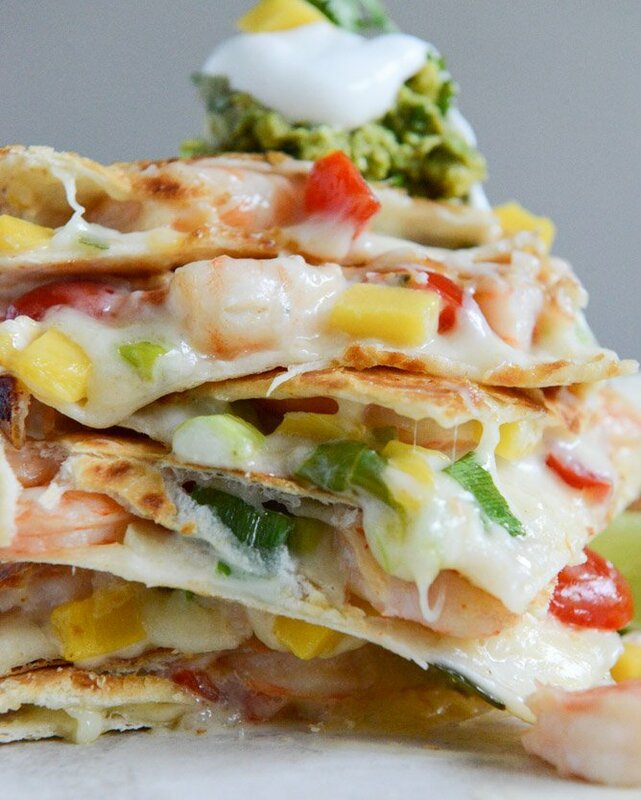 Pingback: 29 Life-Changing Quesadillas You Need To Know About! I just made this recipe last night and it was exquisite! Your recipes definitely dominant my “Favorite Recipes” bookmark folder!